Sample from a chapter in "The Birth of Vengeance"
"Strong characters keep the story going from start to finish with plenty of twist and turns throughout. I can’t wait for the next in the series." "It is such a refreshing change to read a vampire novel that is different from the standard novel. This is no "Twilight" and as such is so much the better for it." Anger consumed my every thought. I’d lost everything and realised what I’d done to Giles not just on that day, but all those days afterwards when I didn’t talk to him. I tried to justify it all this time that I had done the right thing, looked away on that day and looked away every day afterwards as well. My mind raged, and images of Subject X flooded back. “Blood and anger,” she had spoken into my mind. 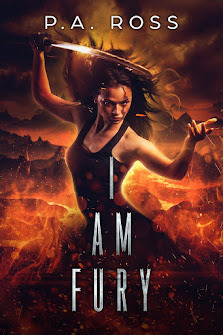 I remembered the image of her, in her true form, a terrifyingly beautiful vampiric rage with blood red eyes, contorting muscles and snarling fangs, smashing at the mirror that separated us. My mind was made up. I had nowhere else to turn. No one else who could help. I didn’t want to be scared anymore, and I didn’t want to be a victim anymore. Things had to change. The formula would either kill me, or offer me vengeance. I didn’t want to end up like Giles trying to kill myself. At least by taking the formula it would give me a chance. Either way this would end tonight. It started to get dark. I turned the music off, slipped the needle into my pocket and stormed downstairs. I slapped some peanut butter in between two slices of bread, as the sunlight faded through the kitchen window. I slipped out to the park, occasionally feeling my pocket for the needle and munching on the makeshift sandwich. The park resided on the edge of a rough area, and I knew I could get into problems just being there, let alone looking for trouble. I walked along the pavement at the side of the road that ran along the edge of the park, and found a tree to hide behind. I leant behind it taking glimpses of them in the playground area. Scattered around the park I saw their bikes and skateboards they had dumped on arrival. The playground area was situated right at the back next to a pocket of trees and fence running all the way down the back. Houses on either side of the park enclosed it in, with just the route across the grass to the pavement and road as the only way in and out. Their dark hooded figures wandered about, as the car headlights occasionally lit them up. They sprawled out around the playground equipment. Two on the swings, one sat at the bottom of the slide, two on the table facing the swings and one walking about talking on his mobile phone. They occasionally got up, passed around the drinks and smokes, threw empty cans against the railings and flicked out cigarettes onto the grass. Their faces lit up from using their phones and the beeping of text messages bounced about to one another. Barry sat on the swings, rocking back and forth, as he dragged on a cigarette and his mountain bike leaned against the playground railings. The others congregated around him and deferred to his presence, making it easy to spot him. They were all there and most importantly the ones who attacked me, Barry, John and Tony. All the time my hand rolled the needle up and down my palm. I knew I only had to plunge it into my arm, and I might have my revenge. I could storm across that park, with fangs snarling ready to rip their bodies apart. Yet, I still couldn’t do it. I had always looked the other way and hid from trouble. Anger and rage had forced me here, but in the cold night air and the sight of the brutal gang members my real nature took over. I was a coward. The truth was the fear of it killing me held me back. I didn’t know for sure what would happen if I took the injection. It might not even be the formula but some other drug. Even if it did work, was I really ready to be a murderer? Just then, Barry finished his cigarette and jumped over the railing onto his bike. He cycled off out of the park, and I dipped behind the tree. I turned back and watched for a couple more minutes, hoping he would return when my phone beeped. “Call her,” the message read from Mary. I wanted to apologise for hurting Scarlett, but the image of her with Barry still burnt my eyes. Every time I closed them, it stared back at me taunting and laughing. It was worse than the mugging, the bruises were healing but her betrayal would never leave me. I realised how Giles felt about me when I betrayed him. Even if I could speak to him now, I doubt he would want to. I looked up from the phone and Tony and John started heading towards me. Those two again! Tony with his long stride as his clothes flapped about unable to cling to his slight frame. John walked muscularly with intent and his face scowled as he pumped his large muscles. Time to go. Maybe in a few days I could forget what Scarlett had done and try to rebuild our relationship. I could forgive her and hoped one day Giles would forgive me. I would hand the needles back to Dad and try and forget ever seeing the beautiful vampire. I turned to walk off, but I walked straight into someone standing behind me. Barry’s big face grinned as he head-butted me on my bruised nose. I clutched my hands up to protect it as fresh blood ran out, and I staggered backwards from the pain. Hands grabbed at my arms twisting them around my back and turning the wrists over themselves. Pain shot through my arms, and Tony and John manhandled me around and frog marched me back to the playground area where the rest eagerly awaited. Why did I come here? I should have known it would go wrong. Why couldn’t I just take the injection and have my revenge? Barry followed on behind and occasionally smacking the back of my head. Tony and John threw me into the waiting clutches of the rest of the gang. They pushed me down onto the floor, in amongst the cigarette ends and empty drinks cans, and pushed my back onto the metal fence railings. They used their belts to tie my arms to the fence. I felt the damp floor soaking into my trousers; it stunk of beer and urine. I felt nauseous, wet and scared. It was going to be another beating, but probably even worse than before. Barry walked in front of me, crouched down and looked me straight in the eye. “What do you think you’re up to?” he asked, slapping me around the side of the head. The rest of the gang laughed as a pack. “Why you here?” he asked again more aggressively than before. He punched my chest and the air burst out leaving me breathless. “I don’t know,” I answered pathetically, not able to give a proper answer. The rest started laughing again and making vulgar gestures with imaginary women. Andy rummaged through my pockets throwing its contents in front of me. Wallet, phone, keys and needle. They grabbed some of the stuff each and Barry picked up the needle. I just looked at him not sure what to say. Barry nodded at Andy and he punched me in the face, and my head banged off the railings. “What … is … it … for,” Barry said again, but slowly this time as if I didn’t understand the question. In my bruised and dazed state, I said the first thing that came to mind. “Diabetes,” I slurred out of my damaged mouth as my head spun. Barry threw it to the floor and went to stamp on it. “NO,” I shouted desperately clinging on to my only hope of surviving this ordeal. Barry paused with his foot above the needle. “It would be murder, that’s a big step,” I said. Barry stopped grinning, put his foot back down away from the needle, picked it up and walked over. The next words just blurted out. “I need to take it in two hours’ time not now. It would work but would make me feel sick.” I lied. “Stomach ache and loss of bodily control,” I added for extra effect appealing to his nasty side. “What, wet yourself?” he laughed. “Eeer, no, no,” I looked away sheepishly with my best acting. “You do don’t you. Well, get ready, here comes the doctor,” he said kneeling in front of me, while the others pulled up the sleeve of my coat and shirt. I suddenly changed my mind, scared of the consequences either way. Death by unknown formula, or turning into a murderous vampire. I shouted at them to stop. “No, No, please don’t do it; you will regret it,” I shouted but they laughed not understanding my protests were for their own protection. Barry stabbed the needle in without ceremony and then pushed the formula into my blood stream. He stood up and stepped back with his hand clutched around his phone ready to film again. The fluid mixed in with my blood and the changes started, the genetic formula reassembling my DNA into its new code. Explosions fired across my body, and I shook violently as my muscles and flesh contorted as they spasmed into their new alignment. My heart raced trying to keep the blood flowing into my altering body, feeding it the fuel to change. The puncture mark on my arm shrivelled away, and the flesh glowed red with a burning heat that flooded across my entire body. The violent shaking made it look like I was having a fit. The gang started laughing again, and Barry’s face erupted into a malicious grin, excited to be capturing it for future enjoyment. My heart thumped harder and harder into my chest. I breathed heavily trying to pump the oxygen into my muscles, as they struggled to hold onto their shape. It became impossible to keep going, as the momentum tore my muscles and flesh apart. Pain seared through my limbs and I strained at my bonds, muscles tensed and red with blood gushing, as it carried the catalyst from the formula. I began hyperventilating, trying desperately to ride out each surge of pain and fear. But my heart seized, spasmed and pain shot down my left-hand side. My chest felt like it was collapsing and crushing my heart. Finally, imploding in on itself. I screamed as the burning flesh and heart attack took their toll, and everything went dark. My eye lids dropped shut. My senses shut down totally and I drifted off into a black silent world. Peace at last. The formula had solved my problems. I was dead. I didn’t feel pain anymore or had to worry about revenge or love. 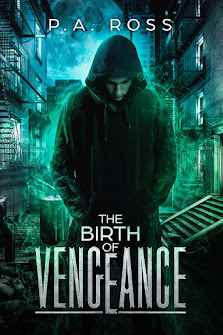 “The Birth of Vengeance (#1 Vampire Formula)” is the first part of a series of vampire ebooks (click here).